It was the worst storm in all the land of Egypt since it had become a nation. The hail had struck everything in the fields – both man and beast; it beat down everything growing in the fields and stripped every tree (Exodus 9:24-25). IT was the seventh plague; a storm of hail sent by God in judgment of the nation that held His people captive. 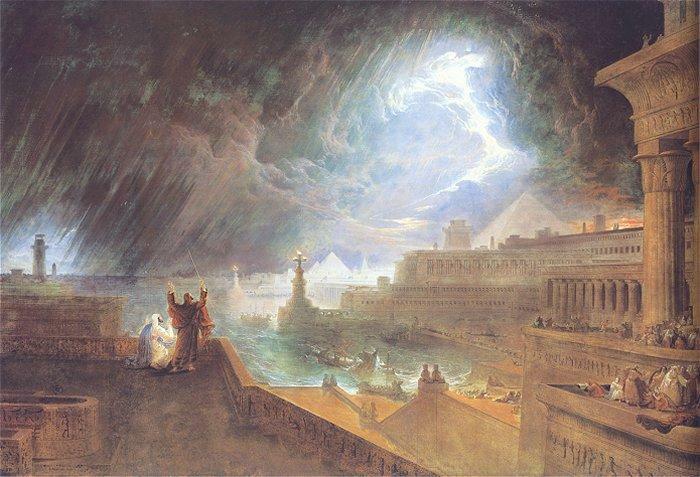 God knew what Pharaoh’s response would be, and still He answered Moses’ prayer to stop the rain. Why? This mixed multitude refers to non-Israelites who decided to follow Israel’s God after witnessing His display of power and judgment of Egypt’s false gods. It is at the seventh plague of hail that we first see Egyptians responding directly to God’s word through Moses. Do you think God noticed these ones? I’ll bet He did. His actions demonstrate compassion in the midst of judgment. That’s our God – seeking to save those who will come even in the midst of the storm. Just like He spared faithful Noah from the greatest storm Earth ever has and possibly ever will experience. Are you in the midst of a storm? Take heart, and be “persuaded that neither death nor life, nor angels, nor principalities or powers, nor things present nor things to come, nor height nor depth, nor any other created thing [storms included], shall be able to separate us from the love of God which is in Christ Jesus our Lord.” (Romans 8:38-39) Amen! You’re always in His hands.